Starnet is excited to announce the launch of our new website. 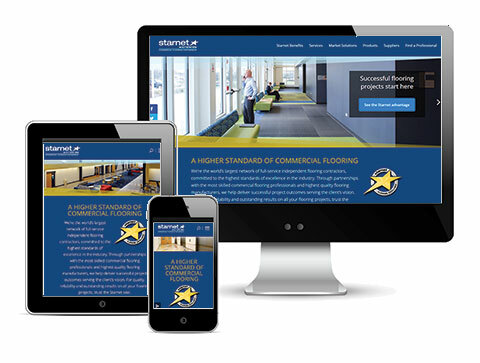 Our goal with the new website is to provide visitors an easy way to learn more about Starnet and its commitment to commercial flooring excellence. We wanted to give visitors an opportunity to know us better, who we are, what we do, our member and vendor partners, and the thought leaders driving the direction of Starnet. Along with new messaging we also wanted to establish a sound website footprint for the future. The new website has been responsively designed so visitors get the best experience on desktops, tablets and cell phones. An easy to navigate menu system provides quick access to Starnet services, programs, contractor finder, and supplier offerings. In addition, simple social media sharing of content is available site wide to foster brand awareness for Starnet and all our partners through channels like LinkedIn, Facebook, Twitter and more. The launch of the website is only the beginning and we will be cultivating new content with helpful information and articles. We hope you find the new website fresh and a valuable resource. For any questions, suggestions, feedback or comments, please take a moment to complete our online website survey by clicking here.